What little girls doesn’t have dozens of adorable Hair Accessories for her hair? With all those hair accessories, including this easy hair clip, comes the need for storing them (or constantly picking them up all over the house)! This super cute and easy to make DIY organizer will help keep headbands, clips, hair ties, and more in one neat, organized place. Begin by spraying the cardboard with the spray adhesive. Quickly cover the cardboard with the fabric you have selected. Work quickly to smooth the fabric out, removing any wrinkles. Set aside to dry. 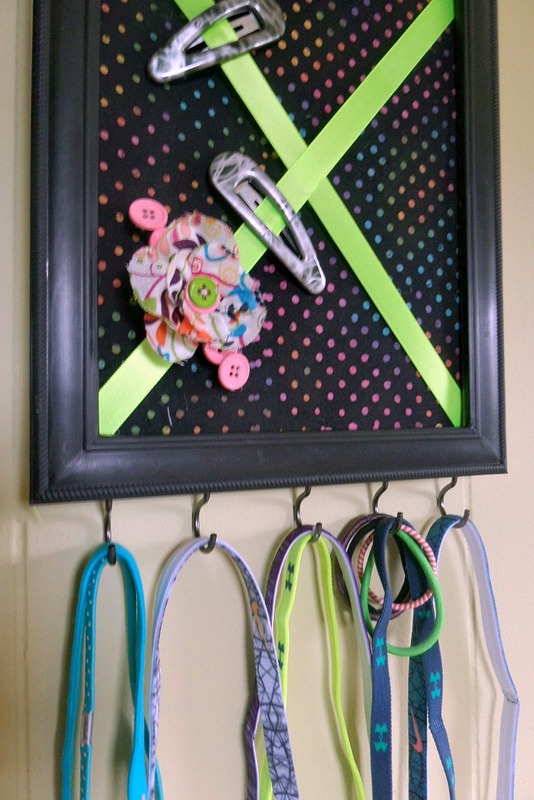 Turn the picture frame over and carefully use the hot glue gun to attach the c-hooks to the back of the frame. After the fabric is dry and secure on the cardboard, use hot glue to attach the ribbon to the cardboard in a crisscross pattern as shown. Allow the glue to dry. Assemble the organizer by placing the fabric covered cardboard back into the photo frame. This should easily fit into the frame with the frame’s glass removed. Place the frame backing in place. The frame is ready to hang on the wall in the bathroom or in your little girls room! 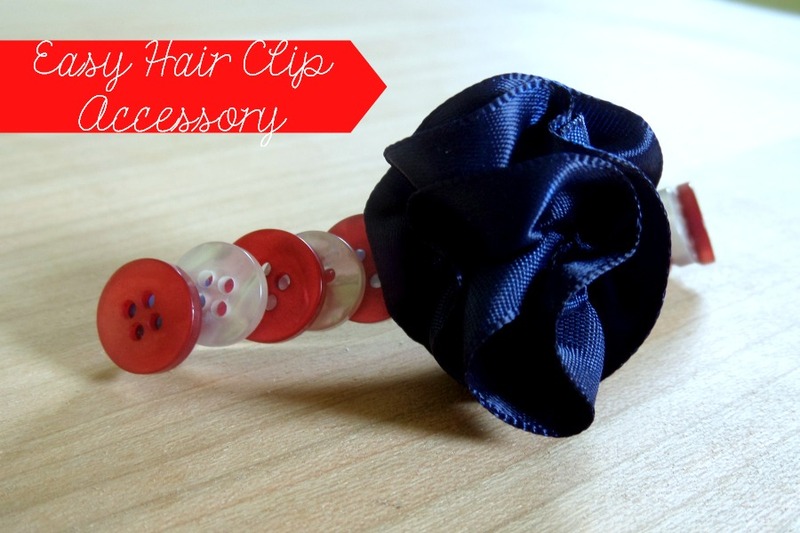 The ribbon is perfect for attaching hair clips and the hooks will hold stretchy headbands and hair ties. 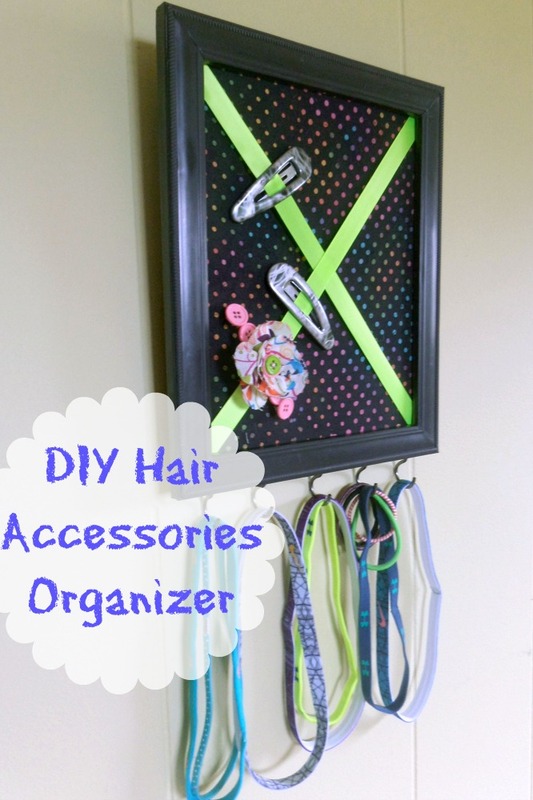 This organizer will hold many hair accessories and keep them from getting lost. This organizer can be created using fabric to match bedding or curtains and for a bedroom or to match the decor of a bathroom. Better yet, make one for both rooms! It doesn’t even have to be for little girl hair accessories. I’m constantly trying to find my hair ties and clips in my bathroom drawer and this could be made in a more grown up version for my things! Love the idea! My hair accessories are all over the place and I usually have a hard time locating them! What a great organizer. Right now my daughter has all of her clips, bows and headbands shoved in a fabric bucket. When she wants to wear a certain headband she has to dump the entire bucket out. Awesome idea. I’m gonna do this one. I love this idea! i have quite a few headbands, fabric flower accessories, etc., that I just keep in a box under the bed. How much better and fun it would be to do this!!! Great idea! This would be perfect for my niece’s hair supplies.